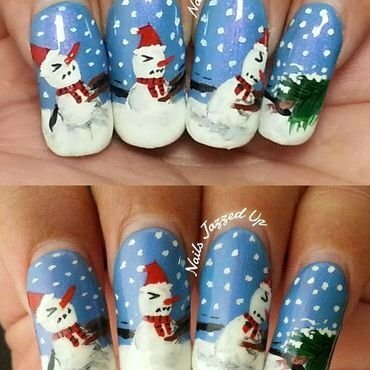 Reindeers for a nail challenge. 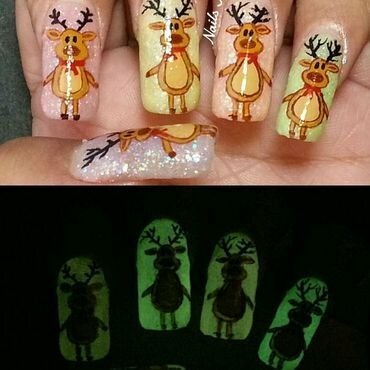 The polishes glow in the dark as well Reindeers are hand painted using acrylic colors. Did a radial gradient on index, middle and pinkie (not that visible in the pic) using Colorclub nail lacquer 'Poptastic Pastel Neon ' Collection. Rest is hand painted using acrylic colors. 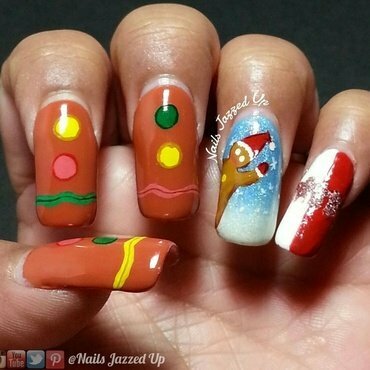 Topped the look with NYX cosmetics 'Pink Avenue' which is clear flaky polish. 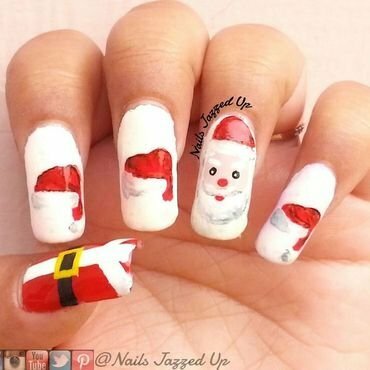 Hope you all like it. 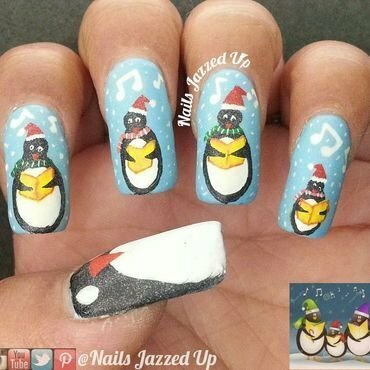 Penguins singing Christmas Carols. I was inspired by the picture in inset. 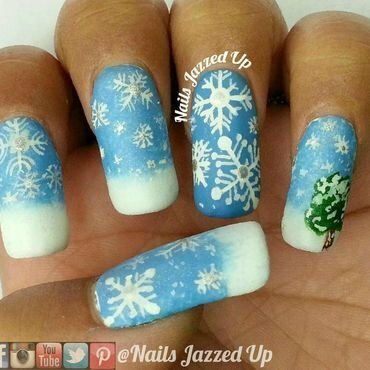 Hand painted snowflakes over gradient base. 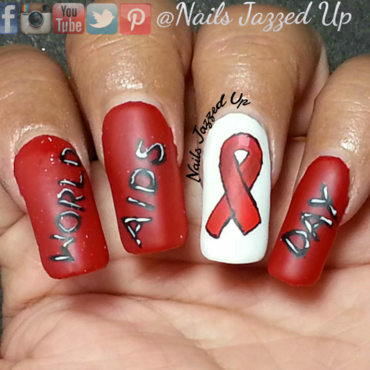 Mani for World's AIDS Day Awareness. All had painted using acrylic colors. Orly nails 'Miss Conduct', a magenta colored polish with scattered holo goodness. It is just a one coater but I have applied two coats of it. 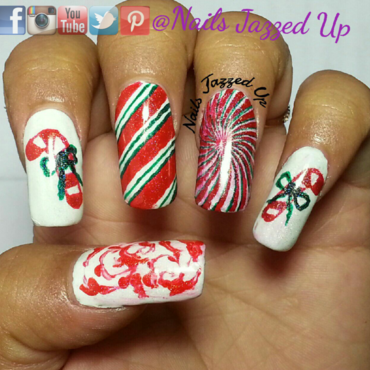 The application is nice and the polish glides smoothly on the nails and dries fast. I love miss conduct and and I am ready to be sent to polish jail for that. On my nails 'Space Cadet' from which is a part of their Cosmic FX collection. This particular polish also comes in their French kit and thus 'French manicure'. 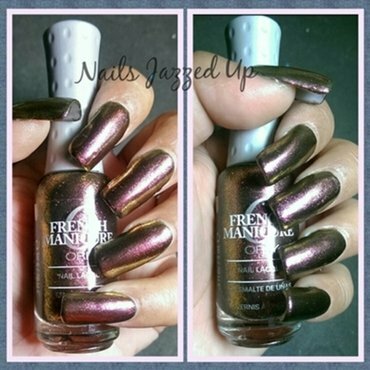 It is a shimmery multi chrome which shifts color from purple to green to gold to orange. The shift is difficult to capture in the camera so given here are two images just to give you all the idea. It just needs more than two coats to give it a nice depth, I have used four coats here but it's not a problem as it dries pretty fast!! I am so in love with this color. Gradient with blue and red color and then stamping with inverted colors.